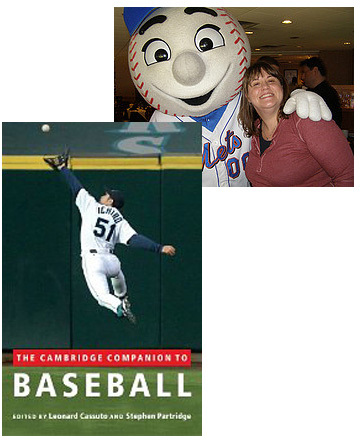 I’ll be returning to Greenlight Bookstore next Monday, June 20, for the next installment of the popular “author/blogger” series I curate there—this month, Caryn Rose, who may be better known to her fans as “MetsGrrl,” will be talking to Leonard Cassuto, the editor of The Cambridge Companion to Baseball, which looks at various aspects of the game’s broad cultural impact in America. We’ve never done a sports-themed event at Greenlight before, but I know from experience that book lovers and baseball lovers are often the same people, so I’ll be curious to see who comes out for this! Greenlight is located at 686 Fulton Street in Fort Greene, very close to the C and G subway lines and just a short walk from the Atlantic/Pacific Avenue station. The event will start at 7:30 p.m. as Cassuto does a short reading from the Companion, then Rose will have some questions for him, and then the audience will get to join the discussion. You don’t need to RSVP, but it’s always helpful to have a sense of what kind of crowd to expect, so if you’re on Facebook please consider checking in. I hope to see you there!